by Myfrenchkitchen.In Uncategorized.22 Comments on A peaceful Christmas to all. Merry Christmas, Ronell, and all the best and much joy and creative ideas for 2008! Merry Christmas, Ronell! I look forward to more of your gorgeous drawings and paintings in 2008. Feliz Navidad Ronell and may all your wishes come true in 2008! Peace and Joy to you Ronell, and we all look forward to a wonderful new year. And a peaceful, love-filled one for you, mia cara!!! The very best! Thank you Ronell! Peaceful to you also and filled with love. What a beautiful candle! 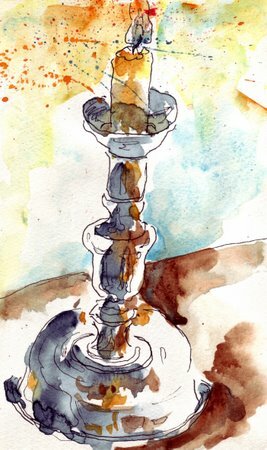 I wish I could find one of these old candle sticks. I love them! Thank you for all your positive comments on my paintings and drawings. Best of all thanks for being you! This is beautiful, Ronell. Have a wonderful Christmas, and a safe trip to the airport! Merry Christmas, Ronell! This is a lovely, lovely sketch. Your candle stick is so nice…….. also, your trees. You sholdn’t be afraid of them, they are great. Peace back at you, Ronell. I love your splotchy colors on this candle painting. I just simply adore how you get that watercolor to do what it does. I may have to try some splattering of my own. The very best of the New Year to you and your loved ones. I hope you had a Christmas filled with laughter and love. I love this combination of colors and your loose drawing. The splatters are a great touch! I hope you had a great Christmas, and will have a very Happy New Year! I love your drawings. I found your site through Lauralines and have added a link to your blog here on my blog. Let’s try for a really, really happy New Year! Lovely candle Ronell – I picture you tiptoeing up stairs with it, so please don’t tell me you have electricity. Happy New Year to you Ronell. I love how free you are with your color. I really like your style. thanks for all the good wishes and all the encouragement! Next Next post: To a 2008 filled with creativity, individuality, hard work and exhilirating results!